Tomas Rosicky to stay for another season Arsenal veteran midfielder Tomas Rosicky will stay for one more season as the boss Arsene Wenger revealed earlier today. Arsenal veteran midfielder Tomas Rosicky will stay for one more season as the boss Arsene Wenger revealed earlier today. 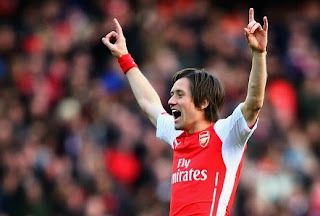 Rosicky has been linked with a move away from Emirates Stadium for the past few months. The Czech international star is not happy at Emirates as he is not been given with a regular playing time. He has been linked with a move back to his homeland. But now the French boss has revealed that he will stay for another season. The 34-year-old has been found with injury problems most of his time at Arsenal, but he has been free from the injuries in the recent months but still not been awarded with enough chances on the pitch. He has started only five Premier League games for the Gunners so far this season. He is expected to start the final game of the league against West Brom on Sunday. Wenger told the media that they have decided for an one year contract extension. Wenger who is eyeing Chelsea goalkeeper Petr Cech for the summer deal might be needing Rosicky’s help as both are from the same country. However, the boss clearly denied that this is not the reason of keeping him at the club.